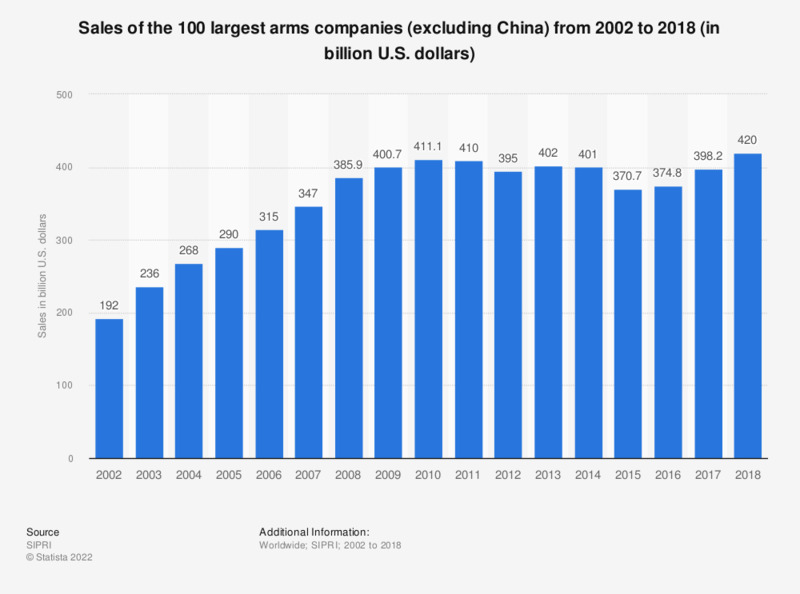 The statistic reflects the sales of the 100 largest arms companies (excluding China) from 2002 to 2017. In 2002, the total revenue amounted to 192 billion U.S. dollars. Sales of arms and military services by the largest arms producing companies (the SIPRI Top 100) totaled 398.2 billion U.S. dollars in 2017. The data from 2002 to 2016 were derived from previous editions of the SIPRI Yearbook. The abbreviation SIPRI stands for Stockholm International Peace Research Institute. From what you know or have heard, do you think that the economic situation was a factor that led the U.S. government to sell weapons to Taiwan? Do you think it is necessary to restrict the sale of weapons in Italy?